You want to gain speed ASAP because this will allow you to go through the route more efficiently. Your first run will be slow and froggish and will feel like forever to pass through maps. Maps who do not contain a merchant have possibility of spawning NPCs that will allow you to make more profit: Moon Bunny: Sells goods for a very cheap price. Masarayu: Merciless Merchant: Buys goods for a high amount. Thieves either steal one item or 20g. Have the map open on a second device until you memorize most of the portals. I will talk about the route I’ve been taking that will help you gain the most of your money. The benefits of this route is that you hardly go through jump puzzles which can potentially slow down your route if you mess. Your first run through this route will take about 10-12mins (2 rotations) each because of your super awesome froggy, but eventually, this will cut down to 7-9 mins (3-4 rotations). 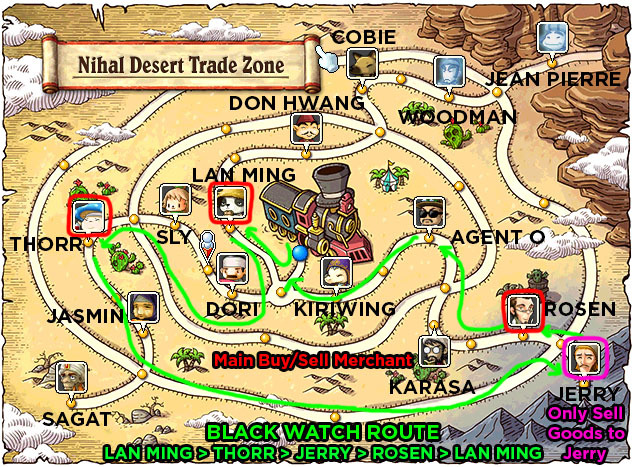 The Blackwatch (my guild) Route: LAN MING -> THORR -> JERRY -> ROSEN -> LAN MING -> REPEAT The following will show you the goods you should buy from each merchant depending on your cash stack. I’ll be explaining more about what you should do below. You will use all your money on buying Cloth Pieces from LAN MING and will potentially max out your 10 storage space. But, now you’re on the way to getting your camel and you women. You will continue your route to THORR and sell all the Cloth Pieces you bought earlier. Profit! Next, you will want to buy as much Cactus Soup from THORR and then to JERRY. Sell all your Cactus Soup and continue to Rosen, don’t buy from JERRY. Once you’ve gotten to ROSEN you’d want to buy as much Silver Ores as you can. Conversely, if you manage to profit to buy more than 5 Black Ores then buy the Black Ores instead. Finally, head back to LAN MING to sell your Ores. Congratulations, you’ve made your first Blackwatch Route. You should have around 200-500g and will have about 14-19 minutes left depending on how well you go through the maps. This part will not be different than the First Run other than you will just buy the Better Goods instead of the Cheap Goods to maximize profit. Finishing the Second Rotation will profit you about 500g+ with less than 10 minutes on your timer. Don’t bother trading any further because you will be wasting time. The next section will explain what you will do with your money to speed up your runs. Don’t Spend Coins on quests/items yet, continue reading the next section before leaving the map. So now you’ve accumulated about 500g+ and now you’re probably thinking of upgrading your wagon. STOP! Don’t upgrade you wagon just yet, instead invest all your money have at least 4 dancing women since they give more speed bonuses than wagons. Time is money and you will want to be faster than any frog around. You will repeat the same method as discussed from the First Time and your goal will to have 1500g+ by the end of that run. Once you have finished the Second Time you will want to upgrade to a Camel wagon and have four women porters. Congratulations, you can now run circles around any froggy in the game. You are now the guy that every froggy will look up to with your camel and four women, so now you will be able to complete rotations much quicker. I will now begin talking about the Expensive Goods you can potentially buy after your first rotations and how to optimize profit. Once you made you first run, you will able to buy more goods, but you can only make minimal returns if you continue buying and selling Better Goods. That is why when you see a merchant selling Embroidered Silk you should buy at most 20% of your storage space. This is because even though you encounter THORR and KARASA in your route there is a chance neither of them will be buying it. I made a mistake thinking that at least one will be buying it and used my money to buy 70 Embroidered Silk, which I couldn’t sell until the last minute because even COBIE wasn’t buying it. Have a good proportion of Better Goods and Expensive Goods means that you will continue to make money even if you can’t sell you Expensive Goods. Also, it is wise to not fully capacitate you fill up your storage because you may have a chance to encounter the Moon Bunny which will sell Goods for cheap prices. Also, you will want to immediately sell everything you have to Masarayu if you can because he will always give you a large return. At this point of your merchanting career, you will be able to gain 1000g+ by the 10-minute mark and more if you optimize the Moon Bunny/Masarayu and the Expensive Goods. You can spend the last 10 minutes exploring the map to finish up any necessary Spiegelman Quest. Enjoying making moe money yo! You must have exactly 2016 coins in your inventory. This can be achieved by subtracting 2066g (50g to deposit) from your total coins (assuming you have more) and donate the difference to the Wealthy Merchant. The minimum coins you need for this is 2067g. How do you get the mounts? You can receive the mounts from Spiegelmann after the run is finished. He has an ‘mount’ option in his rewards window. All the mounts are permanent. What is the Desert Fox? This concludes my Nihal Desert Guide, I’m Aiwok from Reboot from the Blackwatch and this is my first time writing a guide on Reddit so feel free to give constructive criticism. If anyone is looking for a guild, feel free to join ours; we are looking to build a fun and friendly guild. tl;dr. The route will use merchants that buy and sell from each other. Immediately invest women then a wagon for speed buffs. Once fully upgraded, do a couple route rotations then complete. Awesome guide! But have you found oases in one 30mins trade more than once? I found another oases and was teleported to a new map where the merchant hatsar gave me to fishing and to trade the fish for the hero coin.